The partner of footballer Emile Heskey was threatened at knifepoint by robbers at the couple's home. The house in Hale, Greater Manchester, was targeted by two men while the Wigan Athletic and England striker was at a training session last Wednesday. The men stole jewellery before they took the keys to the footballer's BMW X5 and made their escape. Heskey, 30, said his fiancee Chantelle Tagoe had been left "very upset and shaken" by the incident. The forward said he and Ms Tagoe wanted to put the "ordeal" behind them. In a statement, he said: "I am very glad and relieved to report that my partner, Chantelle, was not hurt and my children were away from the house at the time of the incident. "Chantelle was obviously very upset and shaken by what happened and is still very, very distressed but we both just want to put the ordeal behind us and get back to normality." He added: "The incident is being investigated by the Greater Manchester Police and we are confident they will capture the culprits to stop them doing this again to any other families. "If anybody does have any information or think they can help in any way please contact the police immediately." 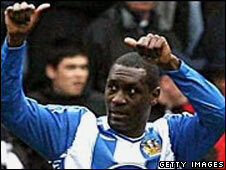 A Wigan Athletic spokesman said: "We can confirm that there was an incident at Emile Heskey's home. Thankfully no-one was hurt." A Greater Manchester Police spokesman said: "Officers discovered a woman had been threatened at knifepoint after two men broke into the address. "The men escaped with a number of items in a stolen BMW. The Premier League player started his career with Leicester City, before moving to Liverpool in 2000. He went to Birmingham four years later and has been playing for Wigan since 2006. His statement continued: "We are both very conscious that many people are victims of these kinds of crimes everyday and my thoughts are with anybody who has gone through what my family is going through at the moment. "But as I say, the event is in the past, I would like this statement to be the end of the matter and draw a line under it and get on with our lives."